When it comes to furnace filters, there are many on the market today. However, it can be a huge challenge to decide which kind to buy. What kind is the best? Do the electrostatic kind of washable furnace filters really work? Let’s examine these questions, and more. Do Washable Furnace Filters Really Work? The short answer to this question is a resounding “Yes”. However, not everyone likes them. It does take a little bit of effort to remove, clean and reinstall them. If you’re tired of spending several hundred dollars per year on high efficiency disposable air filters for your furnace, you may wish to explore washable air filters . You can readily find washable electrostatic furnace filters online for approximately $100. Keeping in mind that this is a 1x investment, giving you a least cost over useful life option. If the air filter is made of high quality materials and workmanship, it should outlast the life of your HVAC system. Imagine not having to buy a new one each month or store a stack of them in your closet or garage when you find them on sale. Imagine simply washing your furnace filter monthly or even weekly if you wish depending on individual dust and dirt levels. 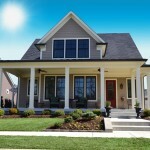 Your home will be cleaner and you’re going to have a lot better health. Plus washable air filters are environmentally friendly, so you’re not adding to the garbage landfill. What Kind Of Washable Furnace Filters Are The Best? There are a variety of furnace air filters on the market today. You’ll appreciate the ease of installation of a permanent air filter for your furnace. You may have a hard time believing that a permanent furnace filter will do the trick. However, these are designed to be easily installed, removed, washed and reinstalled. Dust and debris will get caught up in the filter just as it does in any furnace filter. Instead of having to replace these, you will simply take them out and wash the dust out of them. You can easily wash these in the kitchen sink, shower tub, or a laundry sink, wherever you have water. It’s really simple and it doesn’t take any special skills. You can also wash them with the garden hose out in the yard. This type of washable air filter can also be sprayed with a mild household cleaner to remove any grease or smoke residue. Rinse it well and shake off or drain access water. Replace it into your HVAC system (following directional air flow guidelines if any) and the ventilation air flow will completely dry your clean air filter. You’re in control of when, where and how often you wash your furnace filter. How Do Washable Electrostatic Air Filters Work? 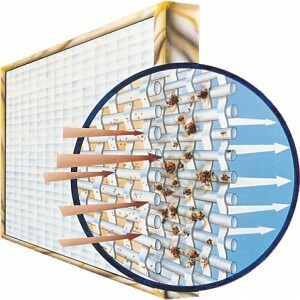 A furnace filter is designed to work by filtering the air that circulates throughout your home. As the air is drawn into the return vents and ducts, it flows through the air filter to remove the dust, debris and any other airborne particles before the air is conditioned by your HVAC system. 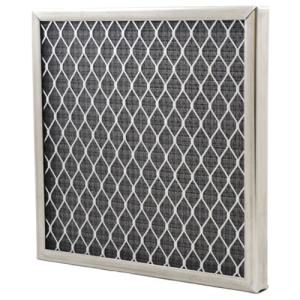 The air filter is meant to protect both the mechanical components of your furnace and the indoor air quality of your home from airborne particles. Electrostatic air filters work by relying on multiple layers of filtration media which clean the air as it passes through the filter. Here, the dust particles are charged by the action of friction between the air that is being taken into the furnace, and the woven polypropylene (manufactured with inherent electrostatic properties) air filter media. As these airborne particles pass through the media, they are positively charged and will quickly attach themselves to the next several layers of the electrostatic filter much like static can build up on your stocking feet as you walk across a carpet or iron filings would stick to a magnet. This action helps to filter out the contaminants and clean the air before it is recirculated back into your home. This action will prevent these dust particles from entering your home and give you cleaner air and a cleaner home. The air quality will be fresher and cleaner as will your home. You’ll have less dusting and vacuuming to do thanks to your furnace filter working hard to filter such things out of your furnace before they ever reach your interior. For the best results, switch the recirculating fan on your thermostat to FAN ON for continuous cleaning versus FAN AUTO where it will only run when your furnace or air conditioning is running. You don’t have to buy replacement filters. Washable furnace filters are environmentally friendly. You’re in charge of how often and when they are cleaned. These electrostatic furnace filters are reasonably priced if you look at their useful life. Most washable air filters come with a Lifetime Warranty. These are readily available online in custom and standard sizes. 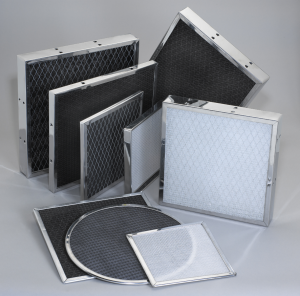 Electrostatic air filters are much more effective than standard disposable filters. You will have to pay more at the outset. You’ll order them online and have to wait for them to arrive. They’re not HEPA filters or electronic air cleaners, and don’t work in the same fashion. You’ll have to take the time (up to 15 minutes) to properly wash them in lieu of swapping out disposable air filters. Washable electrostatic air filters can be constructed differently with a variety of filter media, and may not allow for as much free air flow as standard disposable filters do which may cause your furnace to work harder. How Do I Know Washable Electrostatic Furnace Air Filters Work? This will be dependent upon a few factors. It can depend on the dust levels outside of your home and how they affect your air quality. Every time you open and close your front door, dust and debris will enter. You may have to wash them more frequently if you live on a dirt road, an area that has high dust levels or during times of home renovations. Pet owners find their homes contain more dust and animal dander. Individual hobbies and lifestyle habits can also generate additional airborne contaminants. If you leave your recirculating fan set on AUTO, your HVAC system runs only when your thermostat setting requires heat or air conditioning. If your ventilation system is not running, your furnace filter is not working. For best results your fan setting should be ON, for continuous whole house air cleaning. How Expensive Are Washable Furnace Filters? You can find washable furnace filters online for anywhere from about $30 upwards to about $100. You’ll also want to factor in shipping and handling unless you find some that are shipped for free. Sometimes you can find a great sale as well. Keep in mind that this is a one-time expense vs replacing your furnace filter on a monthly basis so it’s still a good deal even if it does seem a bit high at the outset. Are All Washable Furnace Filters Multi-Stage? No, most of the washable filters are made up of stacked layers of various filtration media with metal or plastic support. As the air and contaminants pass through the media, dirt can be collected in or on the woven electrostatic media, metal mesh and/or impingement style polyester or foam media. 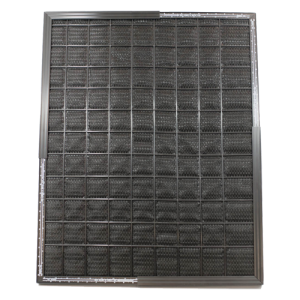 Higher quality electrostatic furnace filters are constructed with multi-stage filter panels that keep the air filter from face loading with dirt, which can restrict the air flow of the HVAC system. 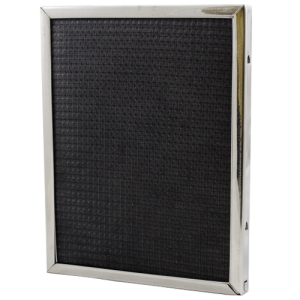 Multi-stage filter panels, with strategically placed drain holes in the frame, also allow for thorough cleaning. Will I Ever Have To Replace My Filter? Many people have had such washable filters for more then ten years. The only reason you’ll ever have to replace it is if you find a better one or if you choose to do so. Of course, there is normal wear and tear on anything. Most washable filters last for at least ten years so you should be just fine if you plan accordingly and take gentle care of your washable filter when you wash it. Most washable electrostatic furnace filters come with a Lifetime Warranty against manufacturing defects. Do I Need Anything Special To Wash My New Filter? No, you can use plain water, or if you prefer, you can use a mild detergent such as a grease-cutting dish soap or spray on cleaner on either side of your filter. Rinse well (until no detergent is coming out of your filter) and shake off excess water. You can allow it to air dry (turning your HVAC system off during this time versus operating your system without an air filter) or reinstall it into the system and the air flow will dry it. It’s that simple. You don’t need any special equipment and you don’t have to use any specialized chemicals to clean your filter. Where to Buy Washable Furnace Filters Online? You can go to an allergy supply or DIY site or you can go to the typical online shopping networks and find washable furnace filters. Pricing varies on all of the sites dependent on the type of furnace filter. However, you’ll want to look at a few of them before you buy as some will have better construction and warranties. Keep in mind that some will also have shipping charges and longer shipping times as well, so you’ll want to make sure that you’re factoring all of this into your order. Do I Need Measurements Prior To Ordering? Yes, you’ll want to measure your old filter and find the one that will fit properly. Keep in mind that the industry standard for disposable filters has historically been undercut by 1/4″ to 1/2″, making it a NOMINAL size. This means when you grab a 16″ X 25″ disposable filter off the rack at your local hardware store, it could be closer to 15.5″ X 24.5″. In most cases, you should be able to use the closest standard size. 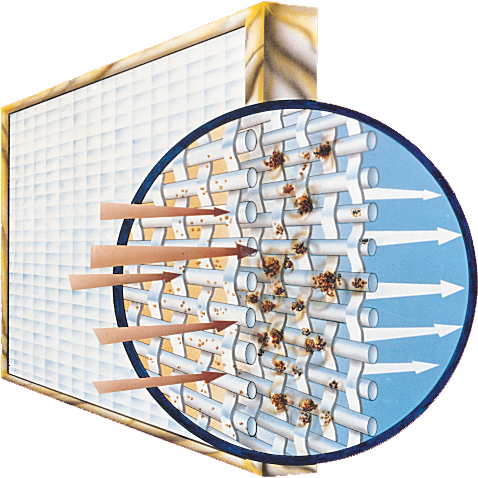 Washable electrostatic furnace filters have a solid rigid metal or plastic frame. So you may need to order an EXACT size to make sure it slides in and out of your filter track smoothly. You may want to measure the duct opening using a flashlight and a stiff tape measure. Look inside the section of the furnace where the filter should be located. You should have a 1″ filter track or opening where the filter slides into. Measure the height and width of the duct opening. You can also contact customer service or your local HVAC contractor, and they will help you to determine which filter size you should order for your specific furnace. Always double and triple check so that you get the proper size of furnace filter when you order. There’s nothing worse than having to wait for the right size when you’ve received a wrong size.